Two years ago, we were given the chance to drive a remote-controlled tank. It was real. It was full-size. We can't stop thinking about it. Trust us: If you ever did this, it would haunt you, too. This is Flashback Friday, a weekly feature where we republish classic stories from the Jalopnik archives. Think of it as Jalopnik's "Best Of"' series. We chose this particular story because we saw a tank cruising down the street and thought of Wojdyla. No, wait. We're making that up. We just think tanks are awesome. You don't need a reason. —Ed. It's a robot tank in desert brown, it has a 20mm cannon and tracks. 5 stars aren't enough. It doesn't really have an interior, but since it can be operated from long range, you can be pretty much anywhere within 3 miles and run it, so the outside is the inside. We were standing in a parking lot in Sterling Heights and it was cold out. 2 stars. How do you gauge the acceleration of a tank? The Black Knight stayed in first gear, I wasn't in it, it seemed pretty responsive when I was driving it (Did we mention I DROVE A FREAKIN' ROBOT TANK?!?) but there's no way to say whether the acceleration was good or bad. Stellar. As you can see from the video, the tank stops like it's hitting a brick wall. With no need to prevent broken noses on passengers it can stop however hard it feels like. Better than a 1982 Corvette, but that's sure not saying much. We award it zero stars and may God have mercy upon the rears of any souls unfortunate enough to need a ride inside. Er, how does a remote controlled tank handle? How about this — it did exactly what I asked it to do. A pirouette? Sure. Straight line? Right away, sir. Does it count if I felt the Earth move because the Earth was actually vibrating from it? No? Then it gets what it has coming to it. Without a shifter to throw or a seat to throw it from we couldn't tell how good or bad the cog-swapper was. Not only that, but the Black Knight's handlers kept the thing in first so, you know, no drag racing to be had in the parking lot. There's no audio system save the gentle hum of the Cat diesel pushing it along. In fact, the tracks are actually nearly silent front the coat of rubber on them. But that's a far sight better than a few in-car radio systems we've experienced. 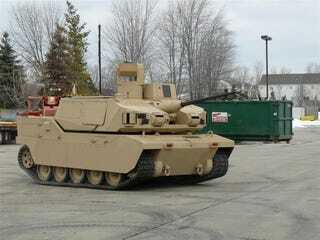 Did we mention this a fully autonomous tank (OMG, I just remembered, I DROVE A FREAKIN' ROBOT TANK!!) with a 20mm cannon capable of real time obstacle detection and independent situational awareness? Yeah, cause it's got that. Again: Robot. Freakin'. Tank. Depends. We don't know how much the price tag is on this system. But how do you put a value on keeping your soldiers out of nasty fire fights? That's for congressional appropriations committees to decide. This story originally appeared on Jalopnik on March 12, 2008 at 2:59 PM EST.